Luminato – En avant, marche! A trombone player, no longer able to play his instrument due to illness, is demoted to playing the cymbals. 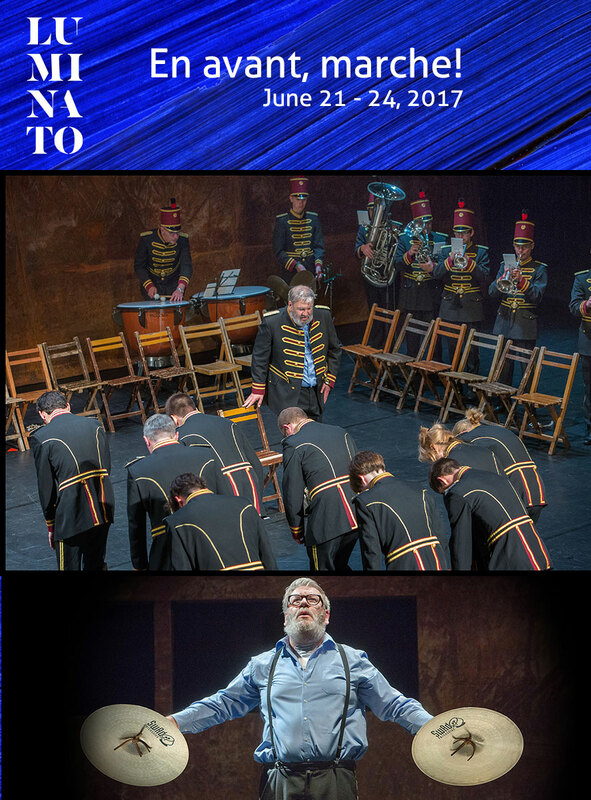 Throughout band practice, our larger-than-life protagonist — personified by renowned Flemish actor and singer Wim Opbrouck — terrorizes fellow band members, confides in the audience, sings arias and dances an unlikely ballet duet, all with exuberance and a riotous slapstick edge. A hit at the 2015 Edinburgh International Festival, this genre-defying tragicomedy from Belgium’s Alain Platel, Artistic Director of les ballets C de la B, one of the most influential performing arts companies in Europe, co-director Frank Van Laecke, and composer and music director Steven Prengels, fuses live music, dance, theatre, opera, and comedy. Four actors and seven musicians are joined on stage by Toronto’s Weston Silver Band, playing marching band classics along with 19th and 20th century pieces ranging from Verdi to Beethoven and Schubert to Mahler. It’s a true celebration of the power of making music together.